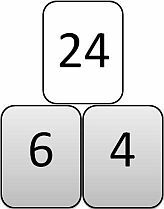 Factors of Numbers Games Help Kids Learn about Factors the Fun Way. We think you will enjoy learning all about factors of numbers and multiples with our Factor-Concentration game. What You Need: Factor Game cards and Multiples Game cards that you will print here. Preparation: Print out the games cards. For best results, after printing the cards, have them laminated to get much longer use out of them. Shuffle both sets of cards. Select someone to the deal the factor cards (the ones with the grey background) face down on the table. Another person deals the multiple cards (the ones with the white background) face down near the factor cards, but far enough way to keep the two groups of cards separate. The first player selects one card from the multiple cards pile, turns it face up, and lays it down in the same spot. The same player then selects one card from the factor cards pile, and turns it face up in the same spot. If this card is a factor of the multiple card, the player turns over one more factor card to find the other factor. If the other factor is found, the player picks up all three cards and puts them in a pile beside him / her. If this is the case, the same player continues in the same manner as above. But if the second factor is not turned over, the player turns both cards face down again and play goes to the next player. If a player finds the second factor, they will continue their turn by turning over a card from both the factor cards and multiple cards in the same manner as before. The game is over when all the matches have been found. At this point all of the players count their cards and the winner is the player with the most cards!